600mm wide and 1000mm high chrome curved tube on tube designer towel radiator with 501 Watt - 1711 BTU/h @ Delta 50. 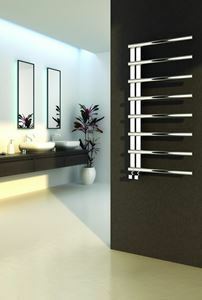 550mm wide and 1000mm high anthracite designer towel radiator with 424 Watt - 1446 BTU/h @ Delta 50. 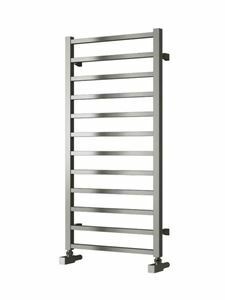 600mm wide and 1000mm high designer anthracite towel radiator with 377 Watt - 1285 BTU/h @ Delta 50. 600mm wide and 1000mm high designer chrome towel radiator with 297 Watt - 1015 BTU/h @ Delta 50.